(Andrew Nelles | The Tennessean via AP) Police investigate the scene outside the Burnette Chapel Church of Christ after a deadly shooting at the church on Sunday, Sept. 24, 2017, in Antioch, Tenn.
Nashville, Tenn. • A masked gunman entered a church in Tennessee on Sunday and opened fire, killing at least one person and injuring seven others before apparently shooting himself, an official said. 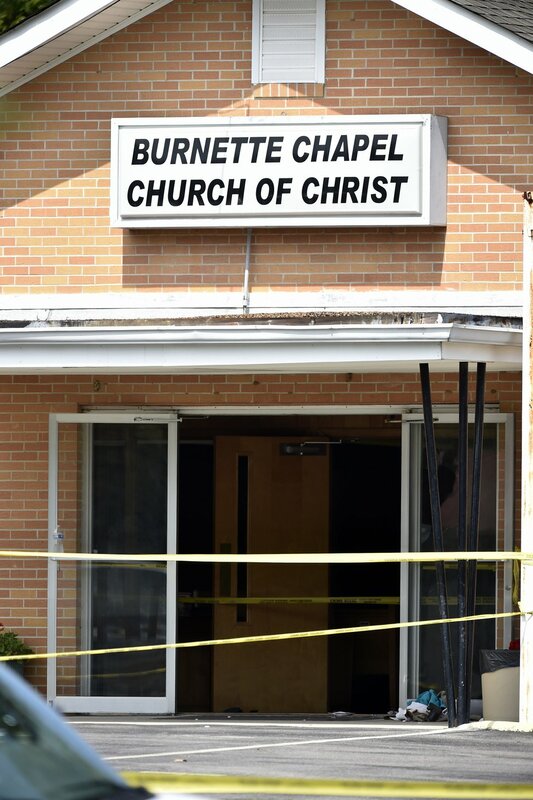 Don Aaron, spokesman for the Metro Nashville Police Department, said the gunman arrived at the parking lot as services were ending at the Burnette Chapel Church of Christ in the neighborhood of Antioch. 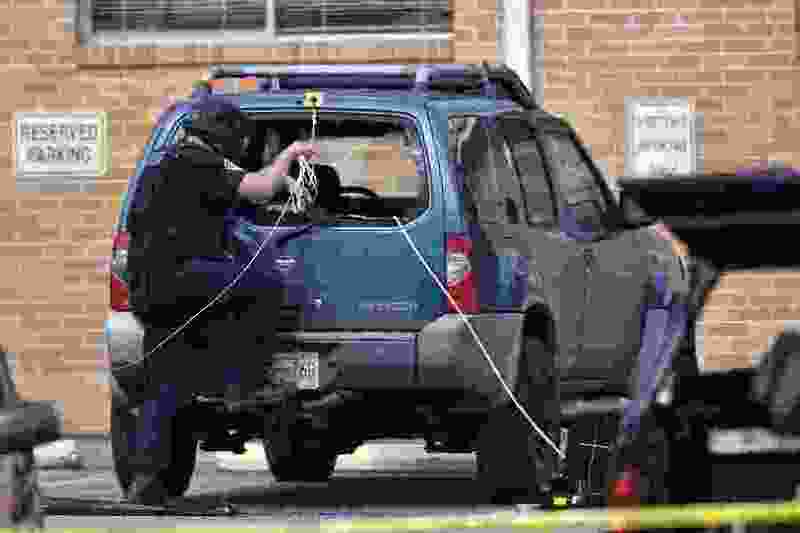 The suspect fatally shot a woman who was walking to her vehicle, then entered the rear of the church, and six people were shot. Aaron says a churchgoer who confronted the gunman was pistol-whipped by the suspect, who then shot himself. The gunman and five others were treated for gunshot wounds at Vanderbilt University Medical Center, Aaron said. One gunshot victim and the man who was pistol-whipped were taken to Skyline Medical Center for treatment. 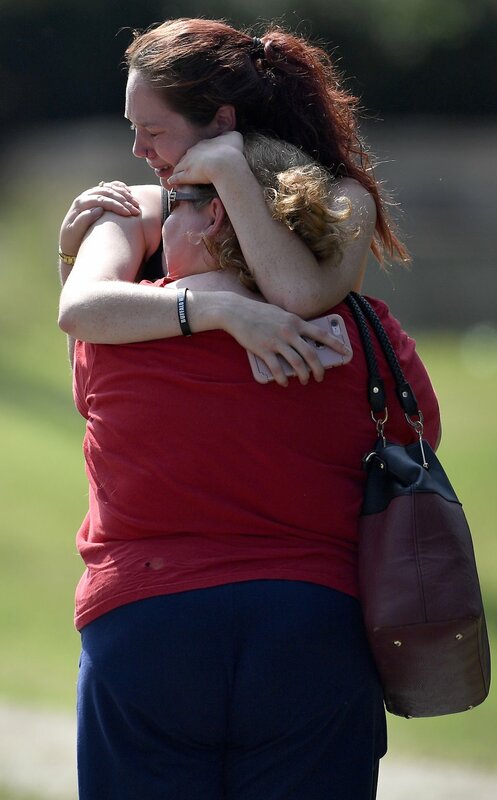 (Andrew Nelles | The Tennessean via AP) Kaitlyn Adams, a member of the Burnette Chapel Church of Christ, hugs another church member at the scene after shots were fired at the church on Sunday, Sept. 24, 2017, in Antioch, Tenn.
(Andrew Nelles | The Tennessean via AP) Police tape lines the scene at the Burnette Chapel Church of Christ after a deadly shooting at the church on Sunday, Sept. 24, 2017, in Antioch, Tenn.
Aaron said the condition of the suspect, in his 20s and from Rutherford County, wasn’t believed to be life-threatening. He was under police guard. His name was not immediately released. Aaron said he was “not aware” of any relationship between the alleged gunman and any of the worshippers inside the church. Congregants who witnessed the shootings were being interviewed by investigators.